Galaxies are stellar neighborhoods of young and old stars. However, these galactic enclaves are only for exclusive members based on age. Some are spattered with young stellar populations and bursting with active star formation; these galaxies are typically blue in color, such as our own Milky Way. Some are run by retired veteran stars; these galaxies are “red and dead”, as star formation has been shut off — or quenched, if you want to be fancy. What causes star formation to shut off in these red and dead galaxies has been a long-standing cosmic riddle. Since the building blocks of stars are cold molecular gas, some mechanisms are thought to drive these gases out of the galactic vicinity. 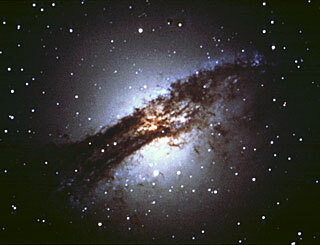 How about winds from supernovae (SNe) or massive stars, collectively known as stellar feedback? 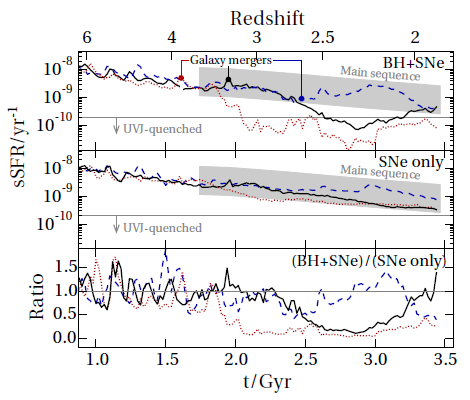 Various research (see this bite, for instance) has shown that stellar feedback may help regulate star formation in low mass (< 10¹² Msun) and low luminosity galaxies. These galactic winds are powerful enough to drive materials out of these pee-wee galaxies. However, stellar feedback becomes increasingly ineffective in higher mass (> 10¹² Msun) galaxies that have more gravity to hold on their gases. Galaxy mergers can lend a helping hand, by stripping an infalling galaxy of its gas supply and inducing intense starbursts (thus consuming gas and causing stellar feedback). However, merger+stellar feedback quenches a galaxy much slower than observed, a hint that another feedback is in action. 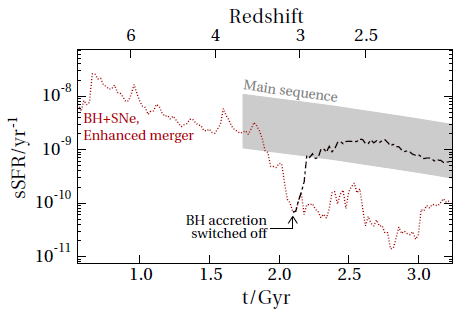 It appears that mergers and AGN feedback work together synergistically to quench a high-mass galaxy. While AGN feedback is essential, stellar feedback is negligible, as outflows from supernova-driven winds struggle to escape the galaxy as mass increases. Alas, it all comes down to a race against gravity…! For more ways to quench your star-formation thirst, check out these related astrobites (1, 2, 3). A zoo of dusty ellipticals provides evidence for merging galaxies “Did I tell you about the time I was hit by a galaxy?” The Hierarchical World of Star Formation The largest, ugliest duckling in the universe.